MONDAY, July 9, 2018 (HealthDay News) -- If they're already infected with hepatitis C virus (HCV), patients in need of a kidney transplant might safely receive an organ from an HCV-infected donor, a new study maintains. Using hepatitis C-infected kidneys for this group of patients would cut costs and waiting times, thereby saving lives, said researchers led by Dr. Mark Eckman. He's director of general internal medicine at the University of Cincinnati. "Increasing the supply decreases the time patients on dialysis wait for a transplant," said Eckman. The key is to treat the disease after transplantation, he said. And curing hepatitis C, a serious liver disease, is easier and less toxic than it was only a few years ago. New drugs have few side effects and cure rates are nearly 100 percent, Eckman added. Because of overdose deaths related to the U.S. opioid epidemic, more donor kidneys are potentially available, the researchers pointed out. But kidneys of donors who had hepatitis C are discarded, even though they are otherwise healthy, the research team said. And many of these kidneys are from younger people. "The quality of the organs, except for HCV infection, is quite high," Eckman said. "What's been frustrating, and a shame, is that the bulk of these organs have been discarded." 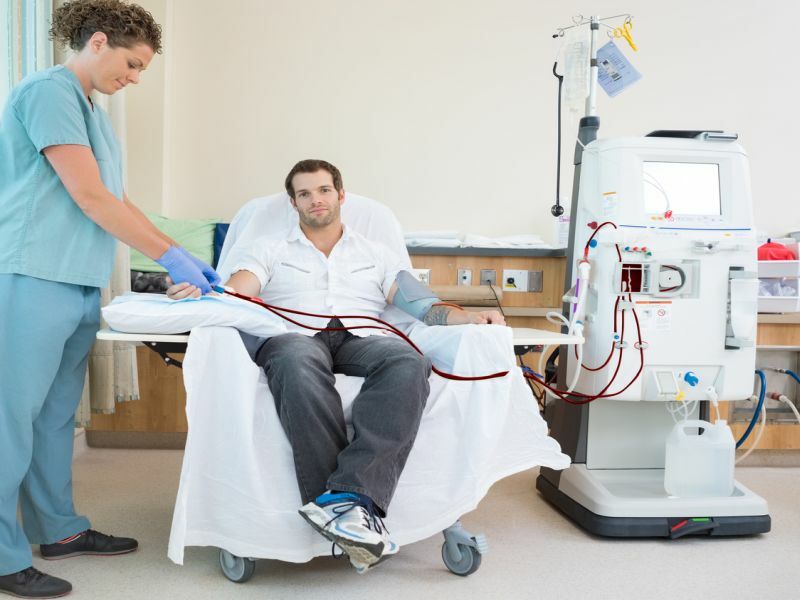 He said about 15 percent of patients on dialysis have hepatitis C.
And in the United States, of about a half-million patients who had dialysis for late-stage kidney disease in 2016, only 19,000 received kidney transplants, Eckman said. This is partly due to organ shortages. The average wait time for a non-infected kidney is more than two years versus just eight months for an HCV-infected kidney, Eckman said. The potential cost savings with this approach could be significant, he added, noting dialysis costs more than $90,000 a year. Because large-scale trials have yet to be conducted, the researchers used a computer model to determine if HCV-infected kidneys could safely be transplanted into patients with the liver disease. They compared these patients with others who were undergoing hepatitis C treatment while receiving dialysis and waiting longer to get an uninfected kidney. The investigators found that use of the infected organs increased life expectancy and cut costs, compared to the other approach. Patients, however, may not want to take the risk associated with receiving an infected kidney, Eckman said. But many might consider it an attractive option, considering the high death rates for dialysis patients awaiting a transplant. Dr. David Goldberg is an assistant professor of medicine at the University of Pennsylvania School of Medicine. According to Goldberg, transplanting a hepatitis C-infected kidney into a patient not infected with the virus might also be effective. "Results from preliminary clinical trials have been very encouraging," he said. In those trials, dialysis patients awaiting a kidney transplant are given a hepatitis C-infected kidney at the same time they start treatment for hepatitis, said Goldberg, co-author of an accompanying journal editorial. Although still experimental, he said this treatment could eventually become mainstream. It may be better, Goldberg added, to have a working kidney and hepatitis C treatment than wait for a non-infected organ that might never come. The report was published online July 9 in Annals of Internal Medicine. Eckman and a fellow researcher reported receiving grants from drug maker Merck while conducting the study. What is hepatitis C (Hep C, HVC)? Learn about hepatitis C symptoms, how you get Hep C, contagiousness, and treatment for hepatitis C.